I recently set a day aside to catch up on some projects for the Jeep. 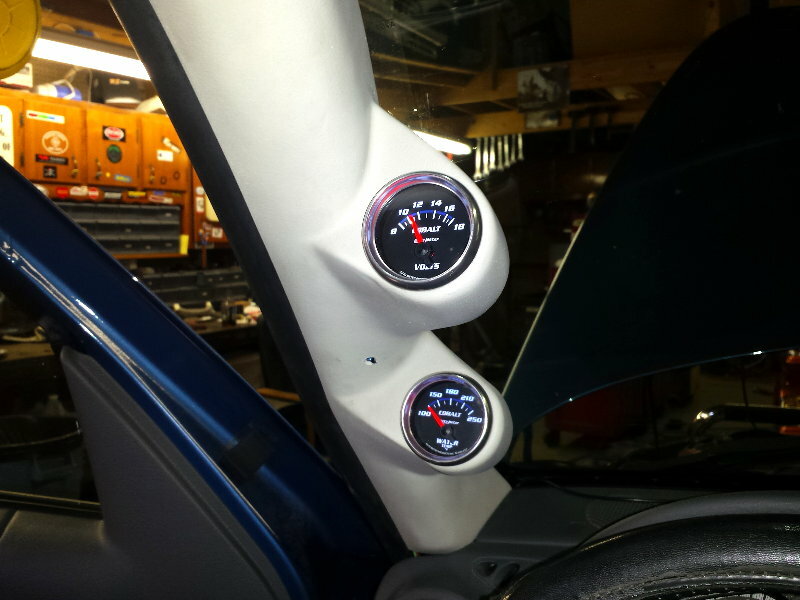 One of those was to install the gauge pod I bought years ago. This was a relatively simple project. It just took me a couple years to finish it. I painted the pod several months ago with official Jeep "Light Greystone" paint. I couldn't find any paint in stores that even came close to matching. I purchased the gauges and pod from Egauges.com. I mounted the temperature sender in the 4J/1G Hi Performance Engine Thermostat I installed last winter. I ran the sender wire to a terminal strip in the fuse area on the driver's side of the dash. I also got power and ground from the fuse area. Probably the hardest part of the project was finding the correct size socket for the grab handle screws. They take a 5.5mm socket. The wires from the gauges easily drop into the fuse block area and connect to the terminal strip.